Pascal deserves his own thread as well. For a 27th pick, it's incredible that we can basically pencil him in for significant production with the 2nd unit this year. He's one of the best open court rim runners in the league, has a motor that won't quit, and comes across as a first class teammate/young man. The big question is whether he can be an impact defender in just his 2nd season. He doesn't get enough talk. I'm really interested in seeing him this year. He can rim run with the best of the quick bigs in the league but he has a little more finesse and shooting touch then... say... Clint Capella. He has all the tools to be a guy who can switch onto 4 positions. He doesn't have anywhere near the defensive awareness or disruptiveness that better but similarly built + motored PF's have (e.g. Capella or Steven Adams). That's what he really needs to be a net positive on the floor. Similarly built? Adams and Capella are both centers whereas Pascal is more of a modern (ie smaller) 4. Siakam's defensive potential is not being a primary rim-protector like those guys, but as a versatile guy that can switch on the perimeter. Last edited by SkywalkerAC; Tue Aug 15th, 2017, 04:08 PM. FWIW, Siakam did have a higher Block % than both Adams (in his 4th season) and Capella (in his 3rd), who are both centers, as well as being in the middle for Steal %. A lot more to defense/disruption than that true, but he'll learn. The Drtg & DBPM stuff doesn't grade too poorly for him either. But yeah, sss. Wait and see. Two beer away from being two beers away. There's nothing modern 4 about a PF with no shooting range (so far). But a high energy big with a good motor and mobility? The couple inches height difference between him and Capella/Adams falls within "similar" for me, maybe not for you. Siakam could absolutely be a mobile, small ball 5 if he elevated his defence as mentioned - that is a big if, he has a lot of development to make on that end. Regardless what you honk of Pascal's rapidly expanding range, it remains a horrible comparison based on size and position alone - to the point I can't even remember what the original point was. Capela is a little longer but Siakam's athleticism probably makes them comparable specimens as far as their max vert reaches are concerned. Capela is 6'11 in shoes. Siakam is 6'9.5 in shoes. Capela max vert: 31.5 inches. Siakam max vert: 36.5 inches. The comparisons were more about their rim running mobility at those sizes (elite), ability to switch onto another position beyond their primary, and how Siakam seems to have a more advanced offensive arsenal and deeper range than Capela. Given the current value of Capela this makes me more optimistic of Siakam's chances of becoming an interesting NBA player. I really hope "what you honk" is not a typo but slang the kids are using these days. I can dig it. "I don't care what you honk!" Yes, it fits nicely. Absolutely right. He needs to either become a mobile, top of the line defender or develop a very consistent 3 point shot or he's going to be a relic in this league. If he can't fit the small ball 5 or stretch 4 roles in the NBA he's not going to have a long career. Sure, and there was some thought Capela might be able to play the 4 - maybe he would have in years gone by - but to my knowledge he hasn't really; Pascal on the other hand has only played the 4 as far as I know. Capela is a shot-blocker/dunker that projects to stay at the 5-spot. 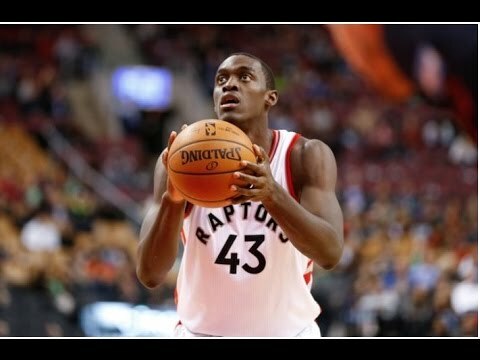 Siakam could play small ball 5 but he still projects as a versatile 4 (with 3-point range as of right about now, not sure how many 3s he made between the 905 and summer league but I remember him taking and making). Then, Adams is strictly a 5 and a pretty traditional one at that. I have no idea how good a rim-runner he is, but he probably has 30 pounds on Pascal. Poeltl is probably more of a power forward than either of those guys, let alone Pascal, so I still don't honestly know why we're talking about them. It's akin to saying JYD didn't have the defensive presence of Antonio Davis - yes, and...? Last edited by SkywalkerAC; Wed Aug 16th, 2017, 03:18 PM. It's about time my boy got his own thread! Can't wait for Siakam to dunk on Embiid this season. Not sure which thread to put this in. Jazz just waived Joel Bolomboy who is a very similar player to Pascal..... a long, energy big with an evolving shot. Drafted 2nd round #52 by Utah. Pascal is a looking like a wasted 1st round pick.